Until Islamabad focuses on building its economy over a sustained period, its insecurity as a state is unlikely to go away. Pakistan national security advisor, Sartaz Aziz, accused India of acting like a regional superpower and said, "We are a nuclear-armed country and we know how to defend ourselves." The scheduled meeting of the NSAs of India and Pakistan was cancelled by Islamabad citing New Delhi's refusal to allow an expanded agenda and involvement of the Hurriyat in the talks. Following the cancellation of talks, Aziz came up with a statement threatening the use of nuclear weapons by Pakistan. This threat, that of using nuclear weapons against India, from Pakistan, is not new and other members of its establishment have made similar statements in the recent past. Why does Pakistan rely heavily on the nuclear threat? Why does even something like cancellation of talks, which is an effort towards normalisation of bilateral relationship, result in a nuclear threat by the Pakistani establishment? Islamabad initiated the development of the nuclear weapon programme with full rigour after the defeat in the 1971 war and the creation of Bangladesh. A deep desire to neutralise India's conventional capability and fear of further disintegration of Pakistan were the most compelling factors for Pakistani leadership to go nuclear. Military has pursued terrorism as a tool against India for four decades now and nuclear weapons have served as a shield for conducting acts of terror. Terrorism in Kashmir and other parts of India such as Punjab accelerated much more after Pakistan acquired nuclear capability in 1987. Pakistan has used nuclear weapons to carry on terrorism on the sly and to prevent a conventional war. Threat of nuclear weapons has been used rather conveniently and frequently by the Pakistani leadership during times of crisis. Pakistan hides behid nuclear deterrence to prevent a conventional war with India. Since the objective of the nuclear weapons has been to neutralise India's conventional capability and also to avoid Indian retaliation to Islamabad's acts of terror, Pakistan's penchant for the adoption and excessive reliance on "first use" doctrine was not surprising. Although the assertion - that of using nuclear weapons first - has varied with changing strategic scenarios, Islamabad has very often stated that it could and would use nuclear weapons as and when it would feel the need. However, it did take a stance during the 2000-10 period that use of nuclear weapon would be the last resort option for Pakistan. What's not clear is what determines "last resort" for Pakistan? Pakistan has the fastest growing nuclear arsenal in the world with reportedly 120 warheads or even more. 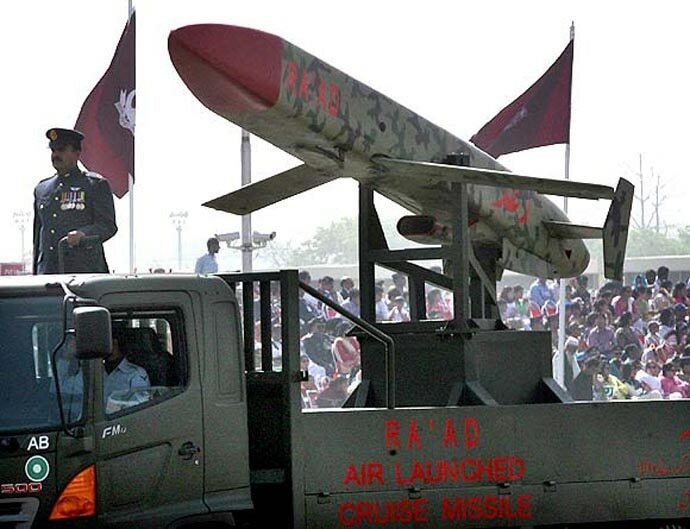 With Chinese assistance, it has also developed land-based ballistic missiles up to the range of 2,500km, as well as built up the cruise missiles - Babur and Ra'ad. It is very proud of having developed tactical nuclear weapons (Nasr) to be used in the battlefield to further deter India from any form of conventional retaliation. Pakistan has excessively relied on nuclear weapons for the last three decades and is likely to continue to do so since it has failed to build other strengths or overcome its fundamental challenges. Its most daunting problems include economic stress, power shortage and rising extremism in the society. Raging insurgency has been difficult for the military to control. Tehrik-i-Taliban Pakistan (TTP) has been launching repeated terrorist attacks, despite military's claim that it has managed to hit the insurgent factions on the borders with the ongoing major operation - Zarb-e-Azb. Being crippled with the inherent problems of extremism, unemployment and low growth, Pakistan significantly lags behind India on most of the parameters of national security. Its excessive reliance on nuclear weapons to project its power emerges from its weaknesses within. It has failed to develop any fundamental strength and support its youth, who seem to be trapped in the culture of violence, terrorism, unemployment and, very importantly so, an extreme identity crisis. Until Pakistan focuses on building its economy with consistent improvement and investments over a sustained period, its insecurity as a state is unlikely to go away. Repeated threats of using nuclear weapons are not an answer to deal with internal weaknesses and challenges. Also, with India's officially declared doctrine of assured massive retaliation, a nuclear attack by Pakistan would result in a significant retaliatory nuclear strike leading to huge destruction in Pakistan.The use of nuclear threats again and again will also not allow any productive steps in the direction of normalisation of the hostile relationship between the two countries. The writer is a senior fellow at the Centre for Air Power Studies, New Delhi.